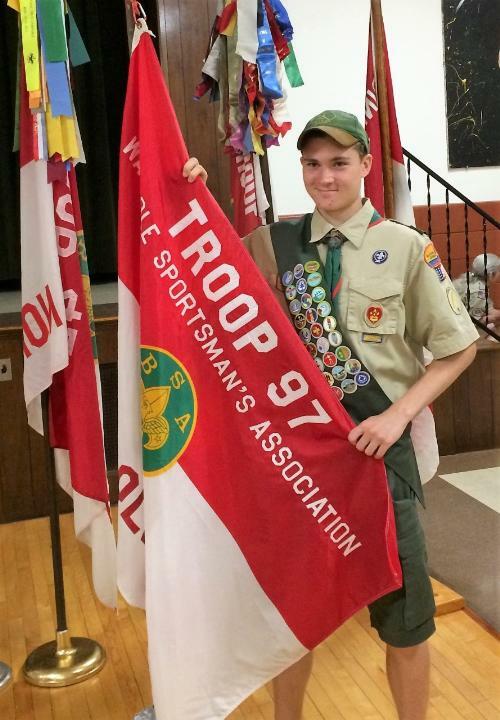 Troop meetings are every Monday at 7:00 p.m. at the Walpole Sportsman Association, 499 Lincoln Road, Walpole, MA 02081. Come join Troop 97 Walpole! The fun and adventurous troop that loves to camp and do outdoor activities! Outdoor activities not your thing? No problem! Just ask our Senior Patrol Leader about a day trip or scout outing that interests you, and the troop will be happy to discuss it at the next meeting. So don’t wait! Join Troop 97 now and start having some fun! Any questions? Click on the "Contact Our Troop" link above. For more than a century, the BSA has helped build the future leaders of this country by combining educational activities and lifelong values with fun. The Boy Scouts of America believes — and, through over a century of experience, knows — that helping youth is a key to building a more conscientious, responsible, and productive society. On Thursday, February 28, 2019, Nick Derenzo earned the rank of Eagle Scout. Congratulations Nick! On Thursday, April 26, 2018 Michael Derenzo earned the rank of Eagle Scout. Congratulations, Mike! On Thursday, August 24, 2017 Sean Corriveau earned the rank of Eagle Scout. Congratulations, Sean! On Jan. 26, 2017 Matt completed his requirements and earned the Eagle Scout rank. Congratulations, Matt. 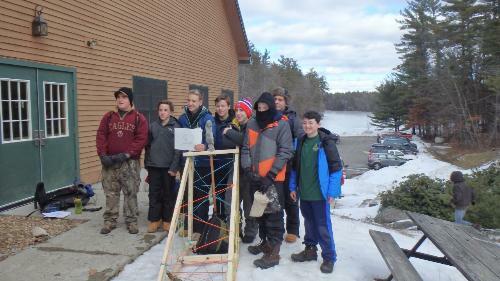 On January 27th - 29th, 2017, Troop 97 traveled to Camp Carpenter in N.H. to participate in the Nutfield/Historic District's Klondike Derby. Events included building the sled they would use for the event, Snow Blind Relay, Gold Pit, Travois Race, Slingshots (it's N.H.), Caber Toss, Balancing Act, Target Range (with wooden tomahawks), Snowball throw, Shelter Building, and Fire Building. Scout participants were, Matt Ferraro, Nick Derenzo, Mike Derenzo, Jordan Smith, Aidan Cullinane, Wally Olsen, Sam Maloof, and Marcus Gurtowski. 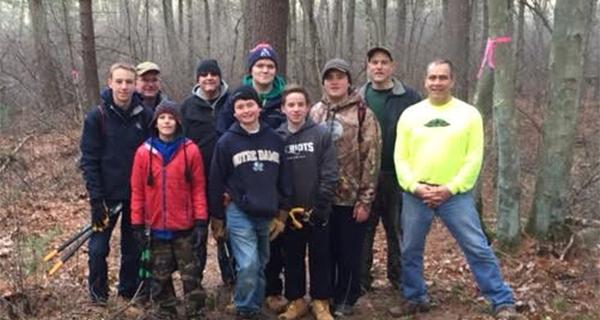 On December 11, 2016, 13 members of the Boy Scout Troop 97 Walpole partnered with the Walpole Trails Committee to clear and widen existing trails. Under the direction of Gary Riggott, the participants cleared three trails in the town forest that connects to the Bay Circuit Trail. This clearing allows for better public access to the Town Forest. The clearing took place at two access points. First, the Scouts cleared two walkable paths next to the Washington Street power lines. After this clearing was accomplished, the Scouts then cleared a trail in the woods at the South Street entrance. To clear these paths, the Scouts trimmed back intruding brush and obstructions. This included the removal of fallen trees, and dead branches. Upon completion, all three paths connected to form a new, longer trail. 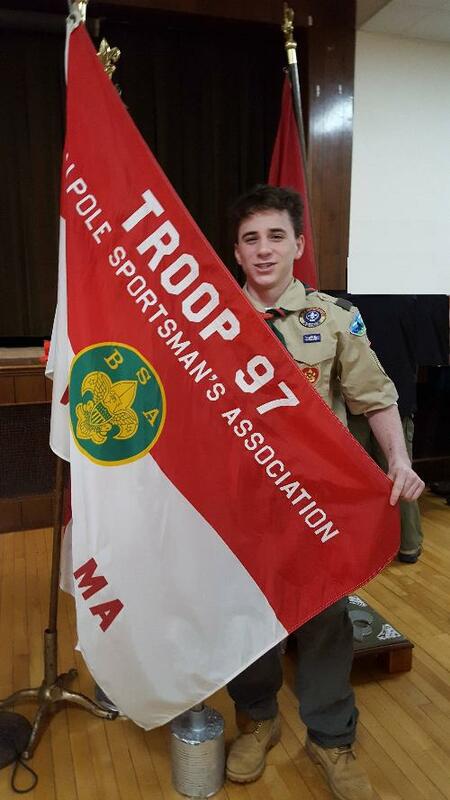 The Troop 97 Boy Scouts involved: Michael Derenzo, Nick Derenzo, Matt Ferraro, Marcus Gurtowski, Nicholas Guyette, Evan Wolk, Wally Olsen, David Conroy, Jordan Smith, and Robbie Stasiukevicius. The Troop 97 adult leaders involved: Ed Wolk, Bruce McClintock, Matt Ferraro, and Trails committee members Steven Riggott, and Gary Riggott.